When the Ringling Brothers’ big top was struck for the final time last May, it seemed like the circus would be gone forever. There’s Cirque du Soleil, of course, but that’s always been “new circus.” No lions, no tigers, no bears — just really good acrobats, fabulous choreography, and a clown or two. Certainly no sideshow attractions, and definitely no elephants. So what is this? I wondered when I saw the posters for a new show at Paris Las Vegas. Circus 1903 claims, like the circuses of yore, to be “the most amazing show on earth.” Well, just like in the olden days, you can’t find out by standing outside the tent. This circus’s “tent” is Le Theatres des Artes at the Paris, which was dark after “Jersey Boys” closed last fall. While it’s not a big top, the theater’s nice “Fin de siècle” décor provides just the right ambiance for a show that captures the feel of an old-time circus without any of the features that no longer please modern sensibilities. Ringmaster Willy Whipsnade, played by magician David Williamson, opens the show with a bit of popcorn tossing and scene setting that leads into the first act, “Building the Canvas City.” This wonderfully choreographed number features a troupe of “roustabouts” and segues into an amazing acrobatic sequence by a trio of acrobats known as “The Flying Finns.” Plenty more “death-defying” acts follow, interspersed with Willy Whipsnade’s shenanigans. He is charmingly assisted by volunteers — mostly little ones — from the audience. 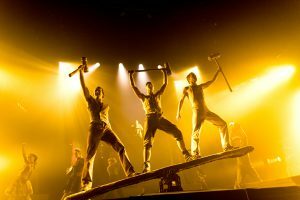 Everything in the show is pure classic circus, from a juggler and a stunt cyclist to acrobats and tight rope walkers. All of this is sweeter because of what’s missing. There are no enslaved animals, no freaks, and, best of all, no clowns. In a nod to old-time sideshows, a contortionist performs. But she’s more of a dancer than a pretzel, and her remarkable bendiness is beautiful rather than freakish. The closest we get to clowns are some foam rubber noses, a couple of volunteers from the audience, and a cream pie. Wait, did I say no animals? Fortunately, that’s not quite true. There are Queenie and Peanut, brilliantly designed puppets that mimic the elephants that inspired them right down to blinking eyes. They’re total scene stealers. “Circus 1903” is an enthralling show for all the right reasons. There’s nonstop action provided by top-notch performers. 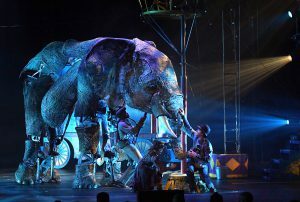 Beautiful stagecraft and choreography are eclipsed only by the two captivating elephant puppets and the talented puppeteers who animate them. Willy Whipsnade holds everything together with humor, great stage presence, and a bit of magic. All this, and it’s perfect for the whole family. It all adds up to pretty darn amazing.